I was driving home from our Christmas visits with the family in central Oregon today. Since we were following Highway 101 through northern California's Redwood Country, we had a chance to look at the Eel River after several days of fairly intense rain. 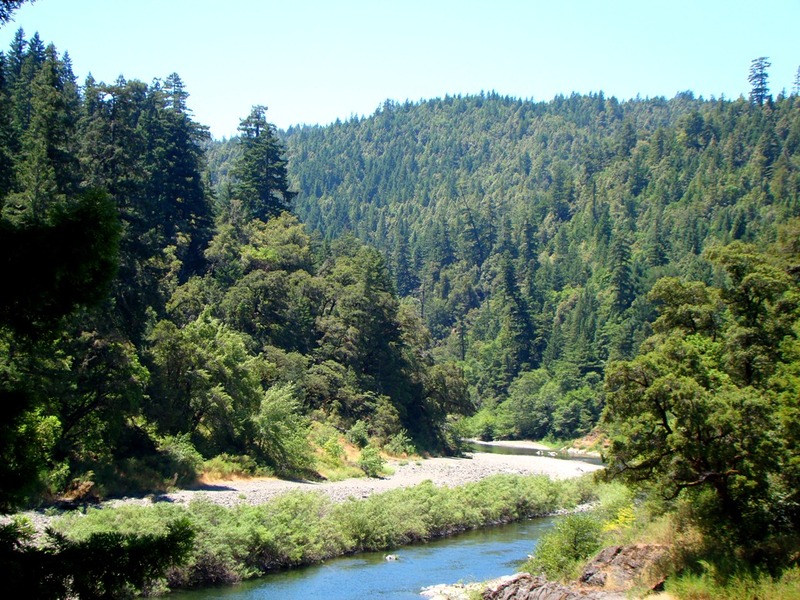 The picture above is a summertime view of the river from 2010 for sort of a baseline for comparing. As we drove along the river today I noticed it was filling the channel and inundating a fair number of trees. I wasn't thinking that it was flooding exactly, but it was full of sediment and moving fast. We stopped to grab a few pictures. You can click on the picture to see the writing better, but it essentially shows the depth of the water, which today was 14 feet deep. 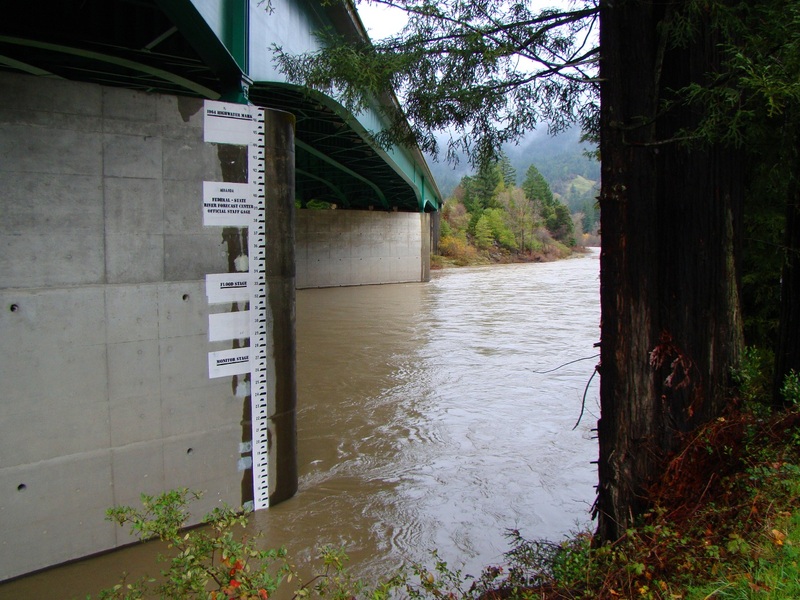 It's not considered to even be flooding until it reaches a depth of 33 feet, which would be a flow well in excess of 50,000 cubic feet per second. But a flood that size would be miniscule compared to what happened here in 1964; the water depth at Miranda was 46 feet, equivalent to 200,000 cubic feet per second. 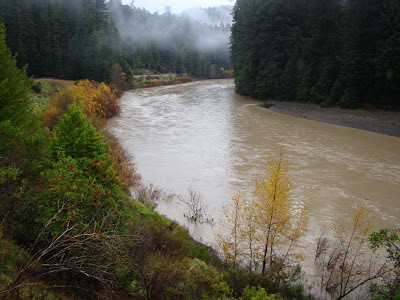 Downstream at Scotia where several forks of the river had combined, the water topped out at an unimaginable discharge of 752,000 cubic feet per second. Needless to say, the damage was incredible, with entire towns being washed away. According to the Department of Water Resources, the North Coast rivers dumped 10.4 million acre-feet of water into the Pacific Ocean in six days. For comparison, Lake Powell on the Colorado River, a 186 mile long reservoir, holds 27 million acre feet. The average yearly flow of the Colorado is 14 million acre feet. It's a big beautiful world out there, and all I can think of for this day is to share a little corner of it with you all, and to wish you all a happy and safe holiday season in all your travels and visits. We've enjoyed a few days along the central Oregon coast, and now we are setting off on the homeward journey (through a rather exciting looking storm!). 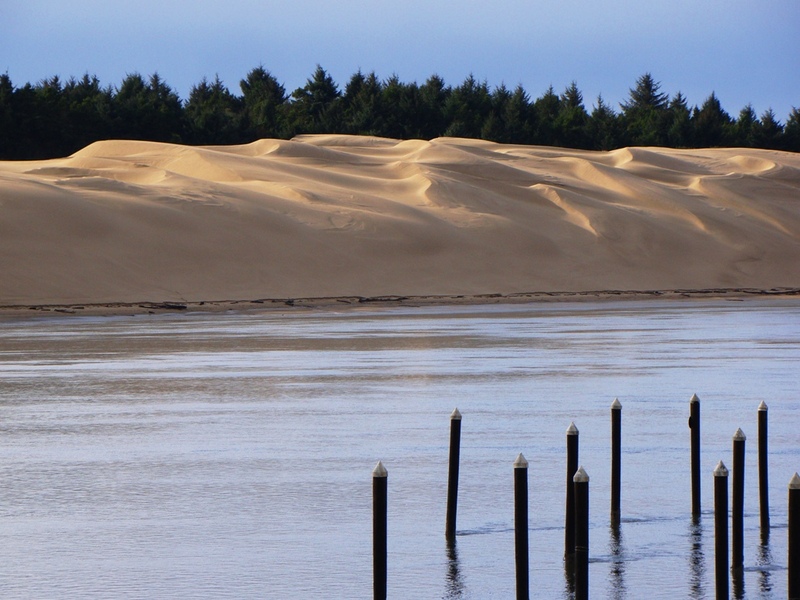 The Siuslaw is one of the many rivers that flow out of the Oregon Coast Ranges to the sea. At Florence, the river flows through the Oregon Dunes, and the mouth of the river is the site of a constant battle between river, dunes, and waves. 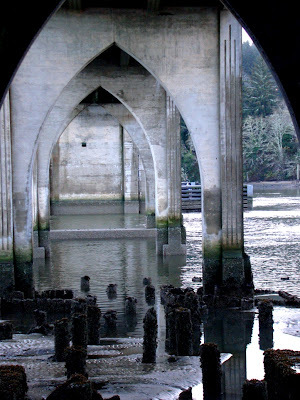 The bridges of the Oregon Coast are beautiful, and from underneath some recall the ruins of Gothic cathedrals. We didn't see a lot of sun during our visit (Really? It rains in Oregon? ), but it peeked out for a beautiful sunset the other day. 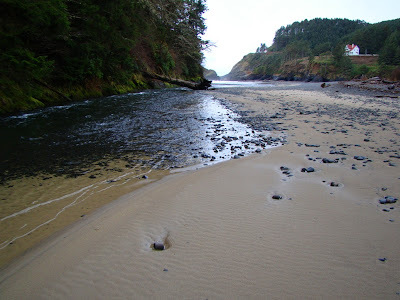 For Christmas Eve, we explored along the coast a bit and found a beautiful spot where Cape Creek meets the sea at Heceta Head. There's a lighthouse hidden in the trees above the center of the photo. Have a great holiday! Peace to all. Now that the apocalypse is over and the world is ended we can get back to life and celebrate what is beautiful about our planet. I wasn't going to take the chance that the world would end with me sitting on a couch at home bored, so I was on the road on the northern California-southern Oregon coast during a pretty major storm. A couple of feet of snow was expected in the mountains, along with several inches of rain in the coastal areas and some very high winds. It was not a day for photography: dark skies and rain made things pretty tough. I only got a few photos that I thought were worth sharing. 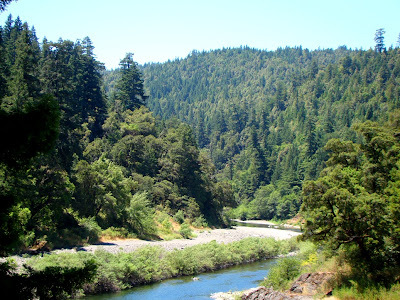 We were at the Kuchel Visitor Center in Redwood National Park near Orick, California for a short break. 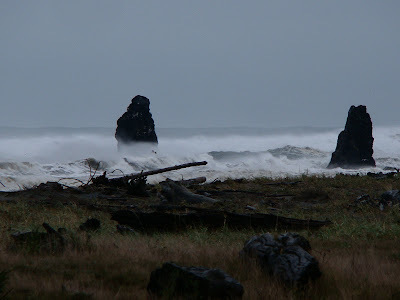 I wandered down towards the beach (without a jacket as usual) and snapped a few shots of the sea stacks just offshore. 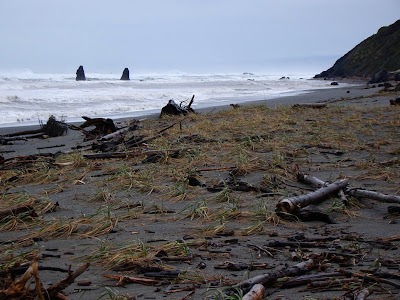 The surf was running at 10-15 feet and maybe more, and the wind was whipping spray off the whitecaps, making for a violent geologic environment. 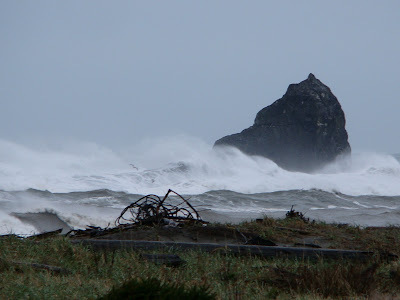 Large winter waves are among the most powerful of the forces in geology, capable of dislodging huge blocks of rock and tumbling them to sand in an incredibly short period of time. One can look at these sea stacks and consider how short a time they will exist before disappearing into the surf. Or...one can consider that they are the last remnants of what used to be land. 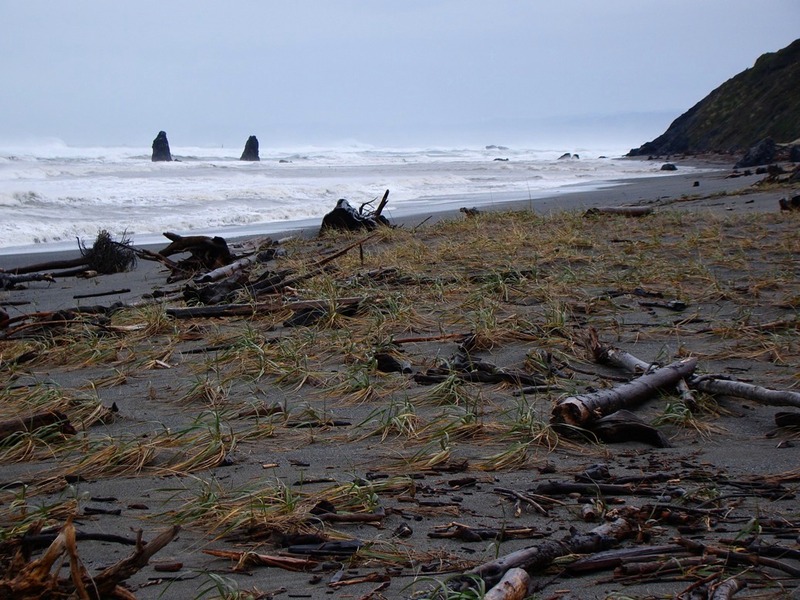 Erosion is a relentless power that is continually and forever changing the face of our planet despite our best efforts to contain it. Worried about apocalypses? It's fun to play with the concept sometimes (I love some of the Google+ and Facebook posters today), but really, it's pretty conceited of us to think that we are such a twisted generation that we get to see the end of the world. There have been plenty of people worse than us in the past, and in the future there will be plenty more. The world isn't going to end. But we do have the power to change the world into a slightly better place before we leave it. The real apocalypse is taking place slowly, one grain of sand at a time. The world will change and all things will pass away. But we have been given a short period of consciousness, and the company of many others, and we have choices about what we do with our short existence on planet Earth. It is just three weeks to the fifth anniversary of Geotripper (that's upper Paleozoic in Internet time). As I noted in my first blog entry, I've taken a lot of digital images and I wanted to use the blog as a way of using the pictures to educate interested people in the earth sciences. I can't believe I've written 1,100 posts, but it has been a heck of a lot of fun, and I've come to know some great people in the blog community as a result. As the blogs accumulated in number, I realized that although people might find the pictures useful (for school reports or research illustrations and the like), there was no good way to track them down in an organized fashion. So I got the idea of doing a separate website where my best geology pictures could be organized by subject matter or location. So, in 2010 or so I bought a domain name (geotripperimages.com; somehow geotripper.com was already taken), and immediately realized I was overmatched. I can follow a template like blogger, but faced with html and utter cluelessness about web publishing, things languished. Finally, I cobbled something together and produced an earth-science based digital image site. It is still incomplete (especially in the rivers, deserts and karst areas), but there are something over 1,000 images posted so far, and the hopefully the navigation of the site is simple enough to follow. So I welcome you to take a look at Geotripperimages.com. So far, I have extensive sections on Volcanism, Tectonic Processes, Erosional Processes, Earth Materials, and Living Things (because every picture site should have furry or scaley animals). The site is meant for free use by students, teachers and non-profits (see the Image Use Guidelines here). If there are authors or publishers who wish to use images in texts or other for-profit publications, we are happy to make them available at a very modest fee, royalty free. You can click on any of the pictures for a fuller view, and most are available at much higher resolution (contact us for more information). Allan is co-author of some great "Geology Underfoot..." guides. Andrew Alden has been blogging about geology for longer than just about everybody, and is still going strong at http://geology.about.com//. He has put together a fine gallery of images. Many geologists have contributed photographs to this excellent image bank (6,000+ photos). Marli co-wrote an excellent field guide to the geology of Death Valley, and has some excellent imagery at this site, including some spectacular aerial photography. A site devoted to geomorphology images (including around 50 of Geotripper's pictures). A good place to find some of the most classic geology photos ever taken. I took a few hours away from grading final exams to get some training at the Great Valley Museum's new facility that will take up most of the bottom floor of our nearly completed Community Science Center. The Great Valley Museum is a modest affair (befitting the town of Modesto?) occupying a few small ancient buildings just off campus. It is ironic to realize that most of their community outreach has been away from the museum and in the hands of their traveling teachers. But that is about to change in a big way: the Great Valley Museum will no longer be a small museum of primary interest to nearby schools, but will instead be a great reason to visit the town of Modesto in California's Central Valley. There will be some rather striking exhibits about the natural history of the region, but there will also be a state-of-the-art planetarium (with a new generation star projector that is the first to be installed in the United States), a Foucault pendulum, a natural outdoor laboratory with native vegetation, and a fully equipped observatory. 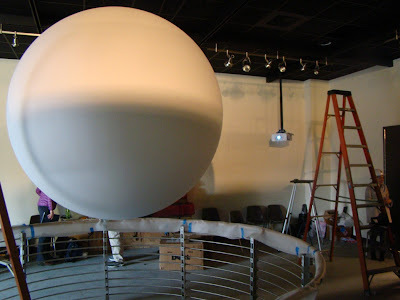 And there will be a big white ball floating in the big room at the end of the building! Well, it's white until the projectors are turned on. Then some magic happens (well, not magic, but science). 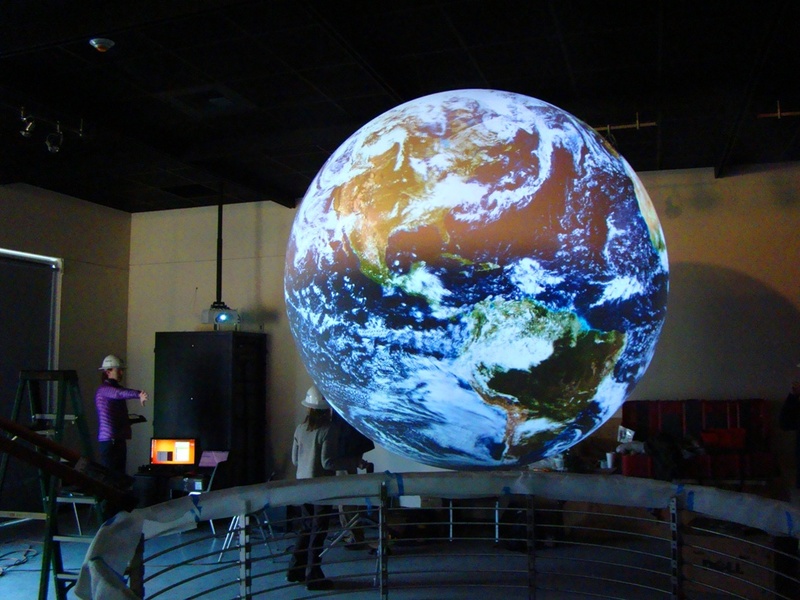 Four calibrated projectors make the sphere glow with a totally three dimensional look at planet Earth, and a great deal more. There is nothing static about this orb. As you will see in a moment, it rotates, and can be manipulated in any direction desired by the presenter. Some three hundred programs are available in nearly all the sciences, but it especially shines in biology, meteorology, climatology, and geology. Many of the programs provide real-time or near real-time views of the earth. 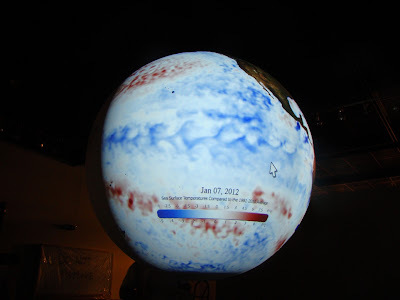 Above is a view of sea surface temperatures on January of last year (and is cycling through December 11, 2012, the day I was looking at it.). The view above shows the age of the sea floor, and the location of plate boundaries across the planet. Nothing quite prepares you for the world in motion. I only got a couple of videos that show things moving. 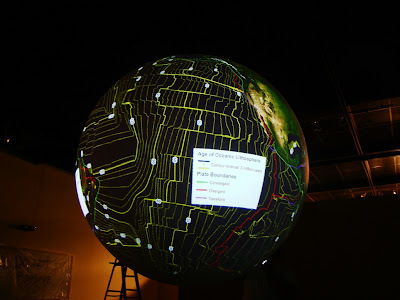 The first shows a rotating Earth, kind of a background appearance when the unit is on, followed by a demonstration of weather systems across the entire planet, visible all at once. Then our trainer demonstrated a series of programs, including near-real-time weather and world seismicity, sea surface temperatures, and world snow cover during the last year. It was astounding to watch, and awakened a million ideas for use in the classroom (or more like moving the classroom into the museum). I'm especially looking forward to demonstrating plate motions through time. 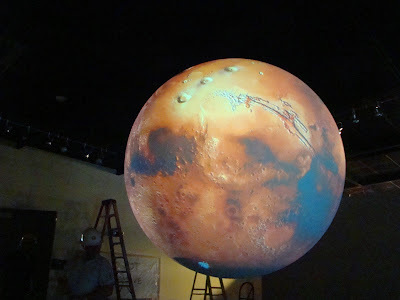 They showed us a few more programs which were quite out of this world (speaking figuratively, of course). Can you guess what celestial bodies we were observing? 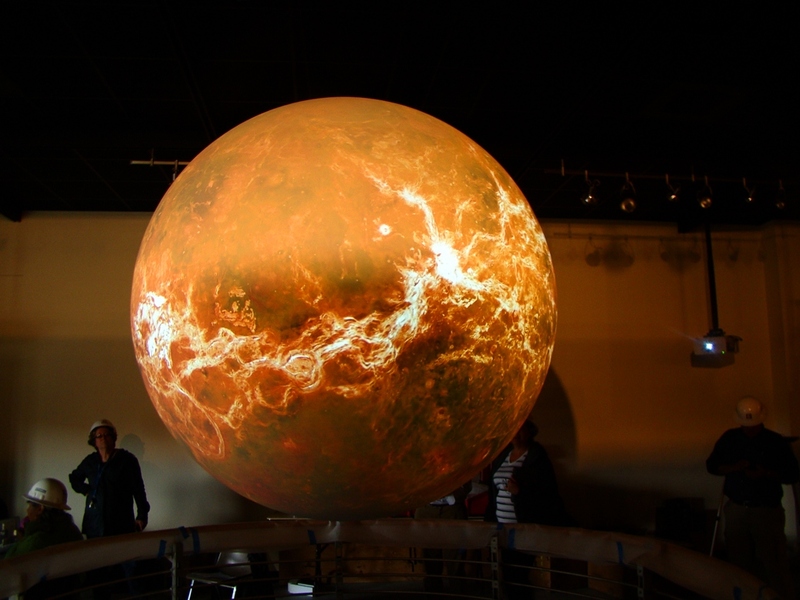 I was really impressed with being able to walk around and see the full scale and perspective of each of these planets. The biggest rift valleys and the biggest volcanoes in the Solar System are visible in the photo above. They don't stand out quite this way on Earth! The body above was even more intriguing to me. 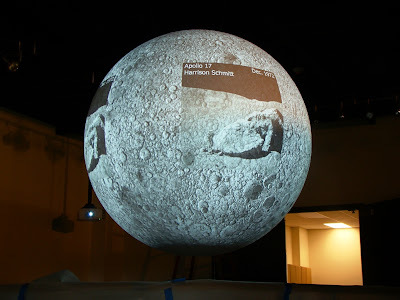 I've seen plenty of maps, but they don't quite have the impact of this glowing sphere. The pictures pretty much give away the identify of the small moon above. 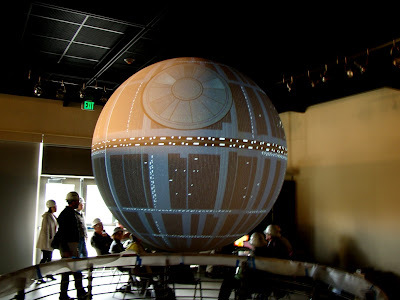 But below...wait, that's no moon! I have a bad feeling about this, Luke! The Science on a Sphere program is a product of a NOAA, and more information can be found at the link above. If you ever come through Modesto on your way to...wherever...be sure to stop in! The museum will be opening sometime this summer. Here is the Great Valley Museum website. It's a Dog's Life...and a Wolf's, too. Why does it matter? This post includes two stories of death and one of salvation...it's a long post, but I hope you'll bear with me. Geotripper is usually about geology and the sciences, but today is a bit of politics, and a story about my animal companion for the last 13 years. It's about a social compact we made with a member of the animal world tens of thousands of years ago. I was talking in the last post about the evolution of the dogs from the wolves, a process that began within the last 40,000 years when groups of wolves cast their lots with the human species and began developing a social compact with us. That unspoken agreement was that in return for food and care, the wolves/dogs would serve us as guards, herders, and companions (and of course at some times and in some cultures, food). Humans became the pack in which the dogs traveled, and although they would never rise to lead the packs, many dogs at least found life a bit less perilous for the most part. In the wilds, life is still harsh. Wolves were extirpated from most of their historical range in the lower 48 states many decades ago as ranchers sought to protect their sheep and cattle from predation. They have been reintroduced to the wilderness of Wyoming, Idaho and Montana, and not without controversy. 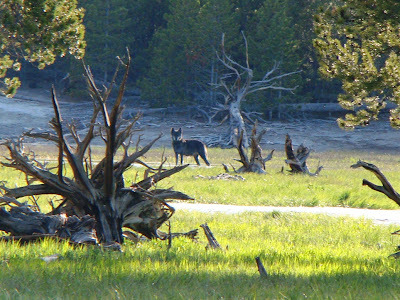 Still, the presence of the wolves has led to a more balanced situation in the Greater Yellowstone Ecosystem; increased predation of elk has led to a rejuvenation of riparian habitats (less overgrazing), which in turn has led to increased populations of beavers and moose and many other creatures. Even grizzly bears have changed behaviors, increasingly scavenging elk kills. 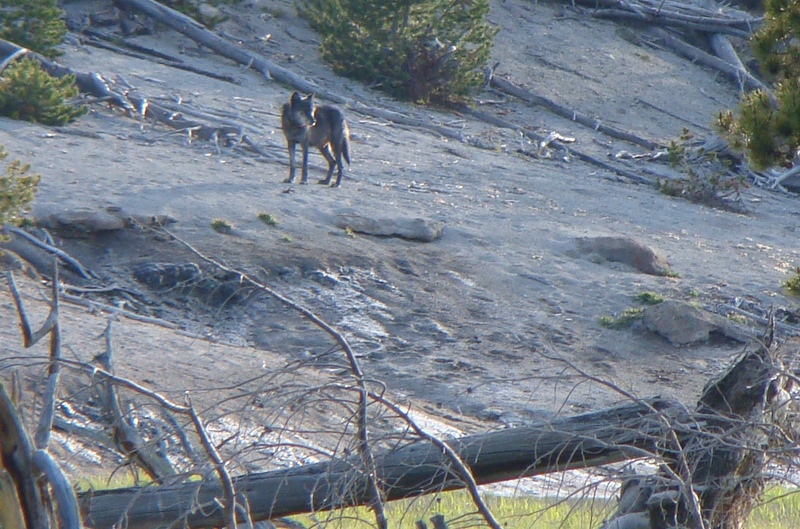 I read with great sadness that one of the most popular of Yellowstone's wolves was shot outside the park boundary for the sole reason that she stepped over a legal line. She had not killed any livestock. No, she was legally shot so some trophy hunter could have another ghastly animal skeleton in his dead animal display. I hope the man is proud of his manliness, because he is truly a manly man now that he shot an animal from a great distance with a high powered rifle that proved what a man he was. I bet his rifle was really long. Nothing like a fair fight, I guess. 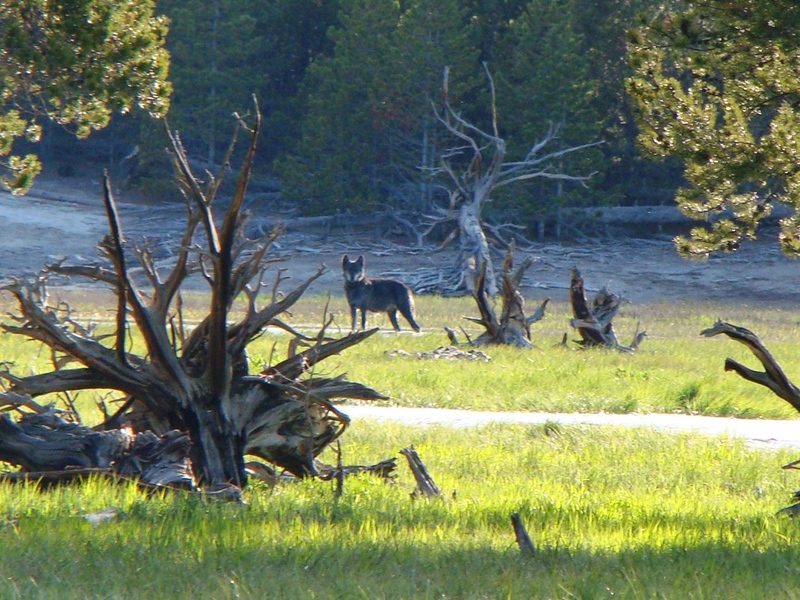 There isn't much else to say, except for the moments of awe that I experienced two summers ago when I finally saw a wild wolf for the first time in my life. It was a privilege to witness such a grand animal in the wilderness. I understand, and can even accept that ranchers have an argument for being able to shoot animals known to be preying on livestock. I cannot condone or even come close to understanding the desire to kill an animal that has done nothing to deserve such a fate. And to the state legislature of Wyoming, which sanctioned these hunts that have killed at least eight Yellowstone wolves, I wonder: What the hell gives you the right? 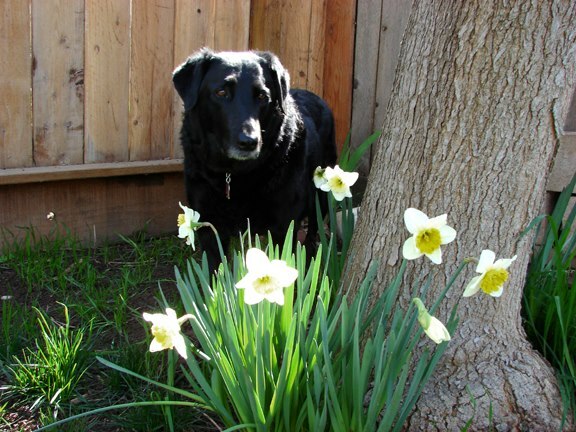 I said good-bye to Angel, my beautiful Labrador Retriever this week after 13 wonderful years of her being my family's companion. At the beginning of her life she was the victim of an unspeakable crime. When she was a puppy, she was continually chained to a tree. The chain was too small for a full-grown dog, and no one ever loosened it. It literally grew into her neck, covered entirely by skin in places. It was plain that she had been beaten as well. There is something horribly inhuman about people who would do this sort of thing. This is as bad as child abuse, and I have no doubt that Angels "owner" probably treated his children the same way. In any case, she was removed from this situation, and we were asked to consider taking care of her. I had my doubts (for 10 seconds or so), and we took the family to meet the dog in my friend's garage (Angel was too scared to be with my friend or with the other dogs). Would she be as vicious as those who abused and tortured her? Or could she overcome the terrible circumstances of the beginning of her life? It took a lot of patience. She cowered from the big bearded guy (me), but eventually came forward and interacted with my two children and with my wife. It was weeks before she started to trust me at all. We loved her from the first, and were heartbroken when she panicked during a thunderstorm and disappeared into the darkness. She had only been with us for two weeks. We drove block after block and couldn't find her anywhere. After two days, she reappeared at our front door, exhausted, muddy, and famished, but she had come home. She cast her lot with us. 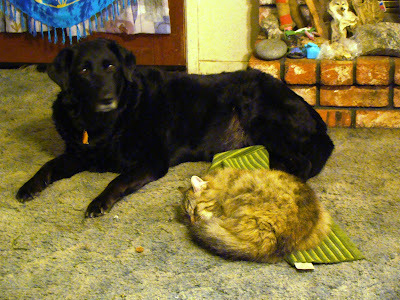 She turned out to be one of the gentlest animals I've ever known. I hope we lived up to her trust. I think she had a good life, and she gave us as much love as we gave her. As the years went on, she slowed down, and spent more time curled up in front of the fireplace, often with the cat practically curled in her lap. A year ago she developed a cancerous tumor the size of a deflated football on her abdomen. We had decisions to make. It's different with humans, isn't it? We can make directives about our end-of-life care and decisions, but all we can do for our animals is think on their behalf. We need to interpret what they are capable of, and what their desires are. Even with the tumor, Angel wanted her walks; she jumped up to greet me at the end of the workday. She still wanted to live. The vet was pretty sure he could get most of the tumor, but he warned us that he was pretty much just buying us all more time to say goodbye, maybe a year at most. It wasn't a hard decision. She had the surgery, and we helped her recover. And she did. For quite a few months, she not only was healed, but she was more active and enthusiastic about things. The last few months were harder. She went deaf. The walks became shorter, and she had trouble negotiating the steps to the house. We knew her days were approaching an end, but we couldn't see the way it would transpire. In the end, she told us. She simply couldn't get up anymore. I spent a very sad night cradling her head, and we took her to the vet in the morning. There was another big tumor. I know there is the logic of science, but have to acknowledge the unknown things too, like looking into the eyes of an animal that you have known for thirteen years, and trying to understand what she needs at that moment. I sat with Angel, and realized she was already halfway into the other world. She had trouble seeing me, her head bowed, her breathing labored. She seemed ready to pass on to what was next. She was laying down, her head in my lap as the vet administered the drug. The pain left her face, and she went to sleep for the last time. I closed her eyes, and she seemed at peace as her life ended. I can only hope so. I know I am not the only person who has ever lost a dog. There are around 80 million dogs in the United States, and thousands must be saying good-bye every day. 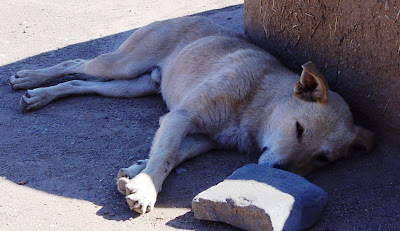 But there was a story to tell about Angel's life, and I hope it can lead to other dogs being saved. Support an organization like LABMED. 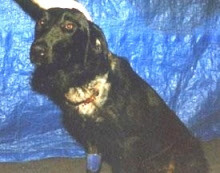 They gave our friends enough money to pay for the surgery that removed the chain embedded in Angel's neck (Angel's story can be seen here). And if you are looking for a dog, consider a shelter or a stray. There are plenty of dogs who need a loving home, and it is our obligation to an animal that is totally dependent on us. We don't need to support puppy mills and the abusive people who run them in order to have a dog built to our odd specifications. According to the Humane Society, only a fifth of dogs are adopted from shelters. So many dogs (and cats) are needlessly killed every year, while people wait for their specialty puppies. This isn't a just ending for the animals that are our companions, the ones who have given us so much for so many thousands of years. This is a story of the evolutionary journey from the first furry things to Fifi the toy poodle...the story of the dog clan on Earth and how a group of sometimes vicious carnivores turned into one of the closest companions to humans on the planet (don't get me wrong; I love cats and horses too). This will be a two-parter for reasons that will become clear. I don't know whether to call the ending happy or sad, because I am still in the middle of it. To anyone with smattering of knowledge of things biological, the idea that predators are going to exist in any complex ecosystem is absolutely logical. Since Cambrian time 545 million years ago, and probably earlier, there have been organisms that cannot make food for themselves through photosynthesis, and must survive by consuming carbohydrates that have been produced by other creatures and organisms. Early on there were bizarre creatures like the anomalocaris that swam about munching on the trilobites and other early Paleozoic sea creatures. Fish ate each other, sharks ate anything that moved, amphibians and early reptiles chased and consumed each other, and in the Mesozoic era, evolution provided land ecosystems with some of the most terrifying meat-eaters of all time: the tyrannosaurs and the raptors (always good fodder for the Jurassic Park franchise). When creatures like the Velociraptor and Deinonychus were munching on plant-eaters like Tenontosaurus and Zephyrosaurus, small furry creatures were running about the underbrush trying hard not to get stepped on or eaten by the larger dinosaurs. They were more likely than not to be active at night. The mammals arrived on the scene not too long after the dinosaurs, but did not become a dominant part of terrestrial ecosystems until a giant rock from space took out their larger competitors (or whatever it was that did in the dinosaurs). Even with the dinosaurs gone, mammals still had to contend with their offshoots, the birds. Some early Cenozoic birds grew to such large proportions that I can imagine their mammal contemporaries rolling their eyes and thinking "not again". There were some early Cenozoic predators called creodonts, and others known as mesonychids who eventually overcame the birds in competition for the top spots in the food chain. From 55 million to 35 million years ago, they pretty much did what they wanted to in regards to procuring food. Smaller weasel-like predators also thrived, and from these smaller creatures, the carnivorans evolved. During Eocene time, around 40 million years ago, the carnivores diverged into the two main clades that we recognize today: the Caniformia (dogs, bears, weasels, skunks, raccoons and pinnipeds), and the Feliformia (cats, hyenas, civets, and mongooses). Members of an early Caniformia family, the Amphicyonidae, are often informally referred to as "bear-dogs" in the sense that they were probably ancestral to both groups. 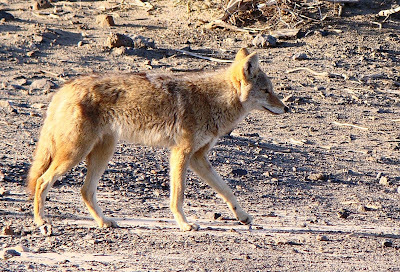 Evolution is a matter of isolation and divergence, and so it was that wolf and fox ancestors diverged around 5-10 million years ago, and coyotes and wolves diverged less than two million years ago. They are close relatives. But not as close as the domestic dogs and wolves. Dogs are wolves in the sense that their DNA is essentially identical. They are the wolves that were domesticated and bred for desirable characteristics, starting around 15,000-30,000 years ago. The intense relationship between humans and dogs had begun. 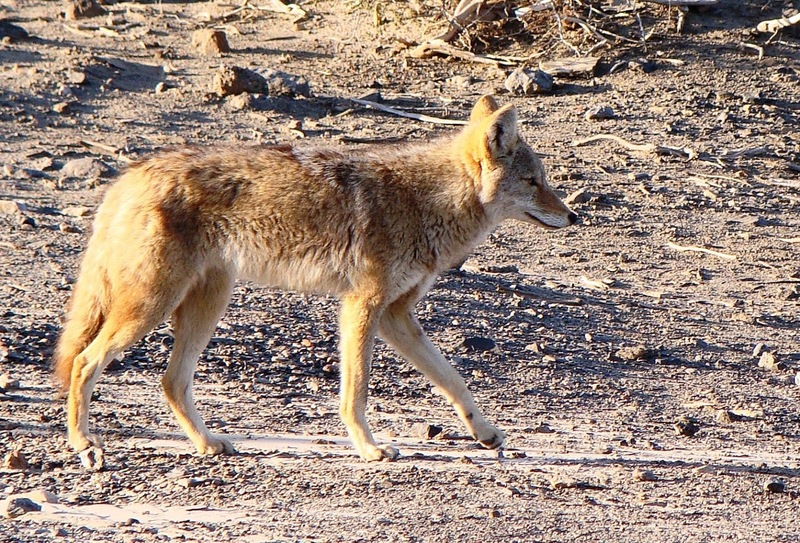 Biologists debate about how domestication took place. Some say that humans raised wolf pups, and eventually their descendants adapted to life with humans. Others argue that wolves took to scavenging the waste along the margins of human camps, and eventually became comfortable with the close association with humans. I'm no biologist, so I really can't judge one way or the other. One thing that enabled domestication of the wolves is that they are pack animals, social beings. Pack life has advantages but it can also be harsh and unforgiving. The smaller weaker animals get less food and fewer chances to reproduce. Rising through the hierarchy required vicious fighting, and a potential for serious injury. I can easily imagine that the rejects from a pack might find a slightly better life around the margins of human settlements, even though they might have been driven off (or sometimes even eaten). But sometimes they also found in human groups another pack. They might never rise to the level of alpha couples, but the food was often better. 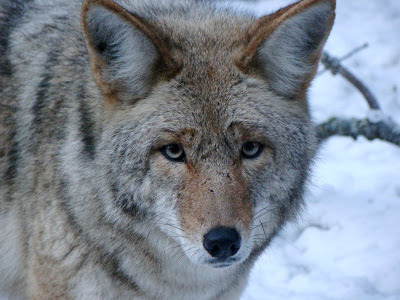 Another thing I know (and so does everyone who has ever had a dog), is that I can gaze into the eyes of one of the canids, and at least partially comprehend their inner life. This is not something that I can do with reptiles, or amphibians, or fish. I certainly cannot do this with invertebrates like insects, crabs or lobsters (there's a reason restaurants will let you see a live lobster that you will soon be eating, but not a cow or a pig). Dogs fit easily into a human pack because they understand our emotions, our body language and our spoken language. They listen to and watch our every move, and every signal (compare this to the way a cat will pointedly ignore such things). To a great extent we also understand their emotions; we know when they are happy, sad, content or scared. So, a group of the canids cast their lot with humans. 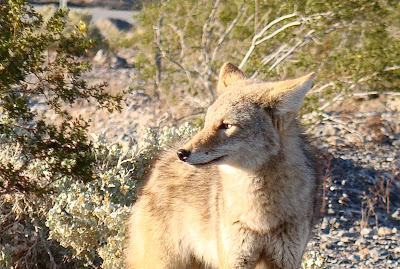 They joined up with us in a symbiotic relationship in which they worked for us as guards, hunters, and companions, and we provided them with food, and a pack in which life was a bit less harsh. We had formed a social compact. Not exactly a compact of equals, but a social agreement nonetheless. What happens when we break that social compact? What To Do on a Rainy Day? 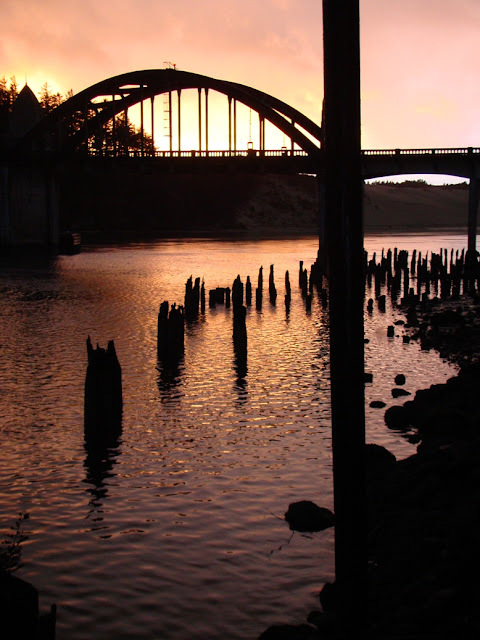 Explore the Mother Lode Underground! So what does one do when an atmospheric river storm is barreling towards your region, with an expected 10"-20" of rain in some places? 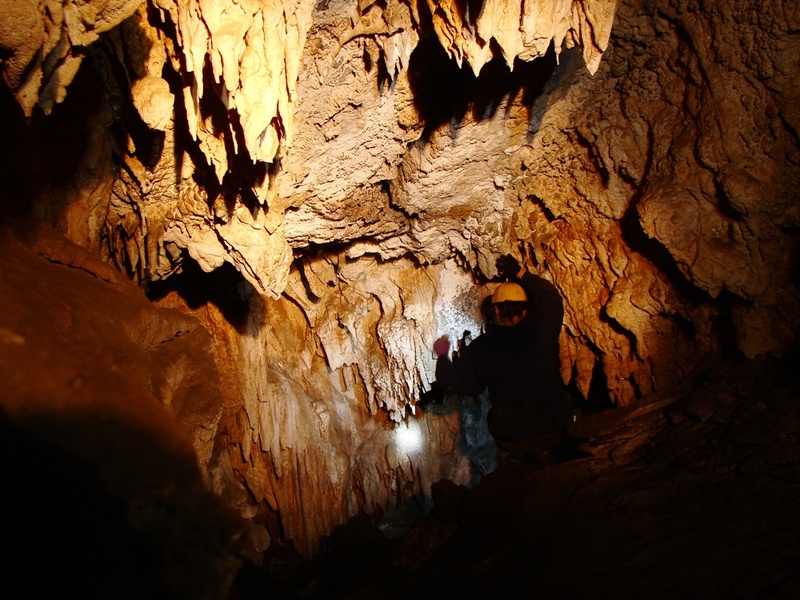 If you are among the intrepid members of the Geology Club at our school, you go caving! It's not that they planned on doing a field trip during one of the heaviest storms of the year, but this was scheduled two months ago. They looked at the weather radar and decided to go anyway. In the end we caught a bit of breathing space between two major storm systems. It was mostly drizzling and misting on us as we hiked the mile or so down the hill to the cave entrances. California is not exactly known for her cavern systems, but the state does in fact have around a thousand known caves, and some are world class; one has nearly thirty miles of passageways. Seven or eight of them are operated as tourist attractions (Black Chasm, California, Mercer, Moaning, Boyden, Crystal, and Shasta are the ones that come to mind). 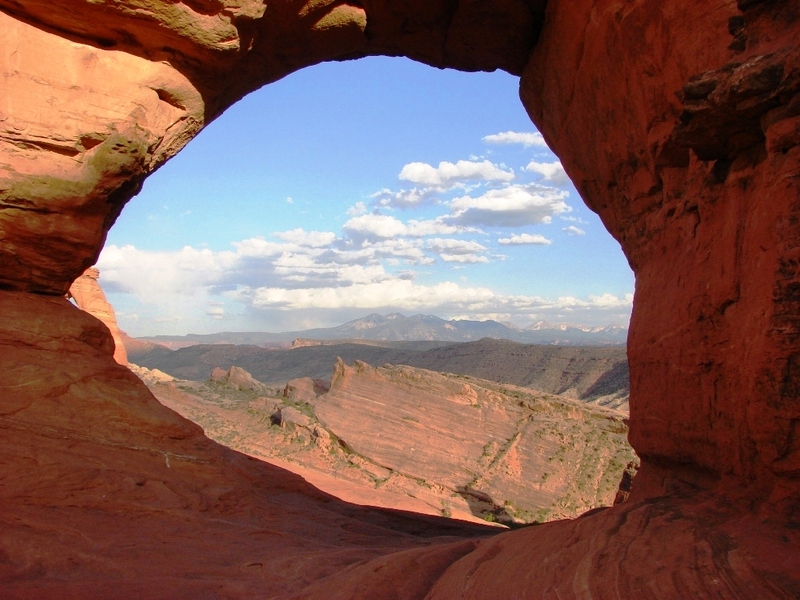 Many are on public land and plenty more are on private land (how cool would it be to have your own cave?) but their locations are not widely publicized, because a well-known unprotected cave is quickly dismantled by vandals, and the damage to caverns is permanent. 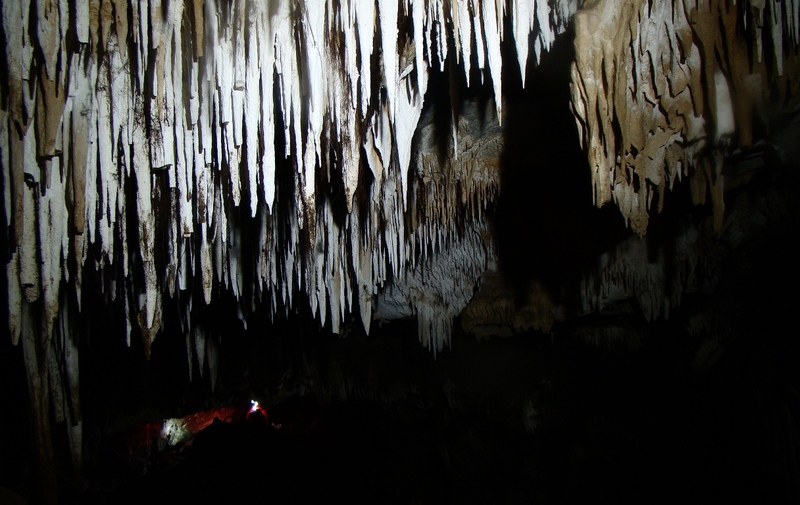 You can't grow stalactites in a human lifetime. 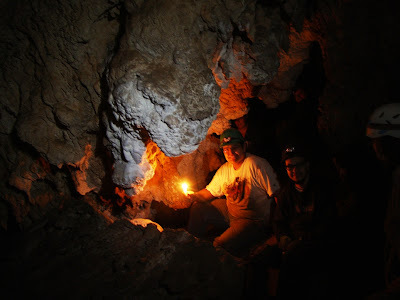 We explore a couple of wild caves in the hills around Columbia. They occur in pods of marble that originated as carbonate reefs and shelf deposits in the Pacific Ocean in late Paleozoic time which were accreted to the edge of the North American plate by the process of subduction. The suite of exotic rocks are called the Calaveras Complex. 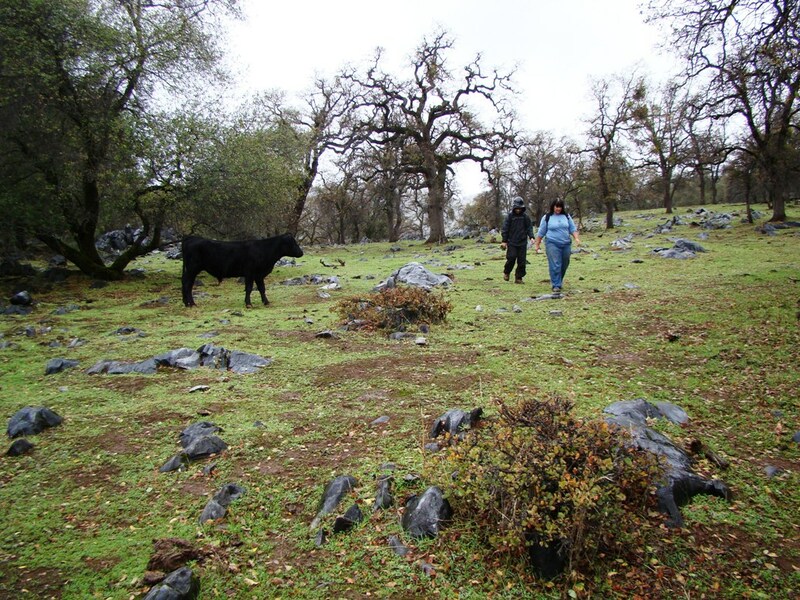 We had to pay obeisance to the mystic black cows that guard the cave entrances (well maybe anyway; they certainly like to hang out on the grass-covered plateau where the caves are located). There were two caves that we explored today. The first was a smaller "practice" cave that provided a few crawling and climbing opportunities and some nice speleothems in a small gallery. The cave had three entrances and several small rooms that angled away from the central area. Caves are explored these days with flashlights and headlamps, but it hasn't always been that way. The miners used candles, and the native Americans would have used torches. The caverns have a completely different aspect by candlelight. There is literally a primal mystery hidden in the shadows. I developed a greater appreciation for the cave paintings done by our distant ancestors in Europe. 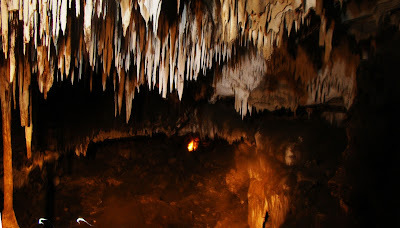 Can you imagine being led into the depths, and then have the torchlight suddenly play on paintings of animals and people in the darkest parts of the cavern? The other cave is a bit more of a challenge. One must first climb down some slippery boulders into the collapsed sinkhole, and then push up through a very narrow passage that is a pretty tight squeeze...especially for late middle-aged fat professors. But what a payoff! 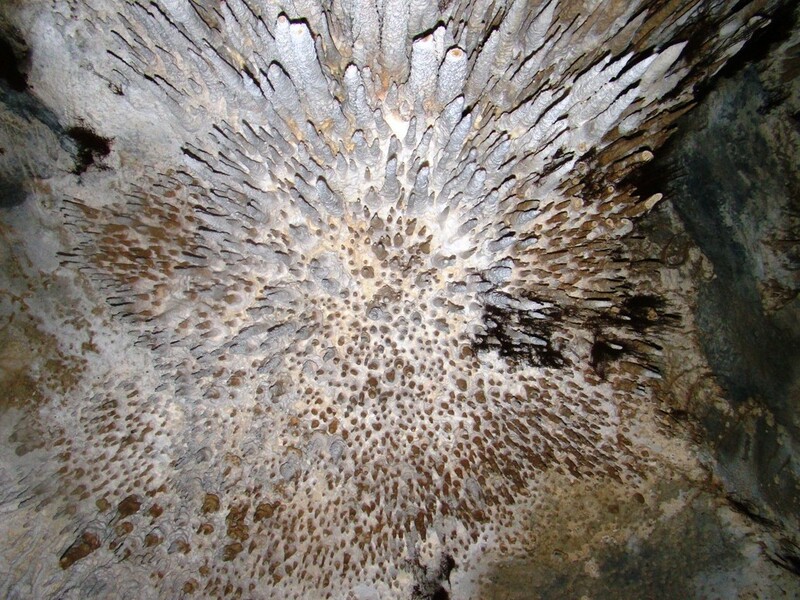 The 150 foot-long main room is festooned with hundreds of unbroken stalactites and columns. The ceiling was high enough to prevent vandals from reaching and breaking them off. And frankly, most vandals are lazy bastards; it's a tough hike and fairly difficult to find unless you know exactly where to look (on my fourth trip to the caves many years ago I got lost in the fog and wandered aimlessly for an hour or so). If you wonder about cave life, there are certainly creatures living in the darkness. 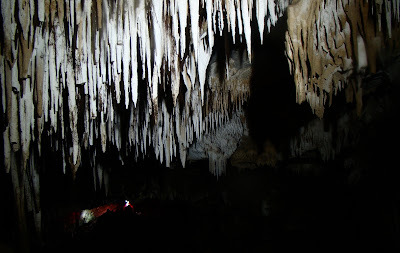 There are usually two or three bats hanging on the highest ceiling (although there is no light, I suspect there is a vertical entrance to the cave somewhere, because I can't imagine bats negotiating the narrow hole we climb through, but maybe they can). 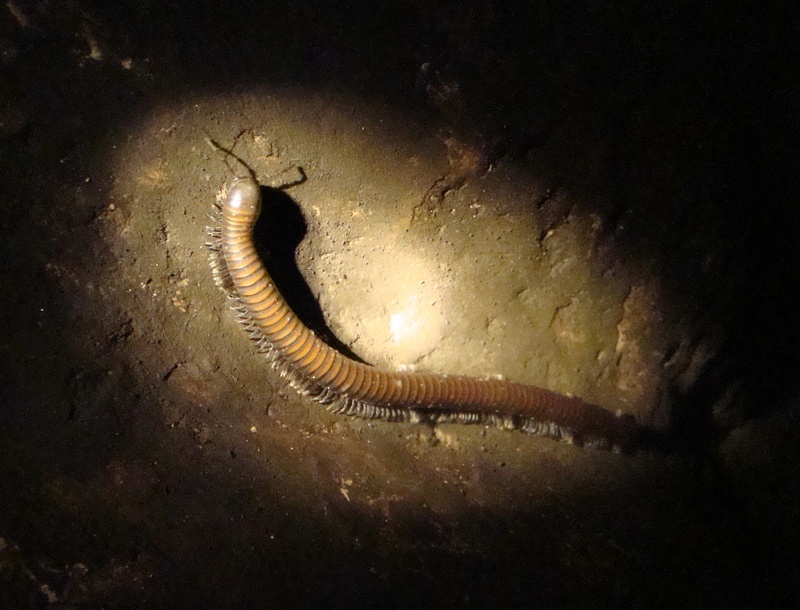 On this particular day we saw half a dozen 5-inch-long millipedes. I'm told they are mainly scavengers and don't bite, but I didn't experiment with the possibility today. I didn't see any of them today, but a couple of years back we saw a beautiful orange newt deep in the cave (I think it is a Sierra Newt, but as in all things biological I am open to correction).